Brush your teeth at least twice a day for two minutes. Plan on spending approximately 30 seconds for each quadrant of the mouth. Use a soft-bristled toothbrush to reduce the risk of vigorous brushing, which strips the enamel from the teeth and causes the gums to recede. Always use ADA-approved toothpaste that contains fluoride. Fluoride helps to reverse tooth decay and aids in strengthening the enamel of the teeth. Replace your toothbrush every three to four months to reduce the amount of bacteria on the toothbrush. A good rule of thumb is to toss the toothbrush when you see the bristles starting to curl and fray. Store your toothbrush in an open area where it can completely dry out before you use it again. Never share your toothbrush as it leads to a higher risk of disease sharing. Keep your toothbrush in a different area from the toilet. Rinse your mouth with water periodically throughout the day, especially if you are unable to brush after eating a meal. Schedule annual cleanings to reduce the risk of plaque buildup and gingivitis. We often have patients ask us about powered toothbrushes and their ability to clean the teeth and gums compared to manual toothbrushes. Several studies have found that powered toothbrushes can reduce the risk of plaque by 21 percent. We do recommend using powered toothbrushes for children as they can struggle to reach the back of the mouth and clean the teeth. 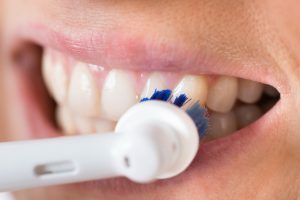 Another benefit of electric toothbrushes is how easy they make it to clean all of the teeth without placing too much pressure to remove bacteria. We encourage all patients to come into our Carmel, IN, dental office or our Indianapolis office for a consultation. We want to help reduce the risk of serious oral health concerns and keep your teeth and gums as healthy as possible.